From the TV channels is expected to provide relatively constant sound volume on their output. A video file may be with too low or too loud sound (typically commercials) and now with DV Play 7.14 you could manually set its volume. 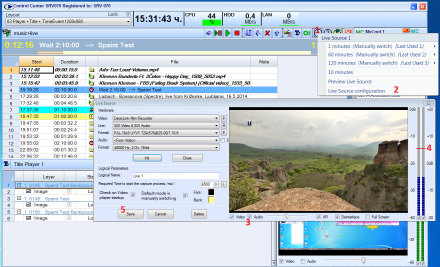 The feature is available for all possible video sources – video files, Live sources, IP items. Manual Volume Control Shows how to set manually the volume level. Shows how to set manually the volume level. Set volume for Live Source Move the slider up/down and save. Turn on the Audio mark to hear the sound on the PC speakers. The neutral position is 0 dB, note that +5dB means 50 times increase of the volume. Move the slider up/down and save. Turn on the Audio mark to hear the sound on the PC speakers. The neutral position is 0 dB, note that +5dB means 50 times increase of the volume.